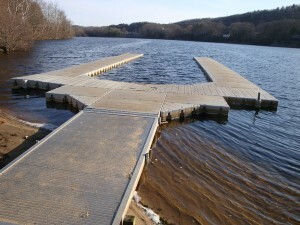 A dock system is one of the easiest methods to gain access to the water, especially when it is used to crossover protected shoreline. 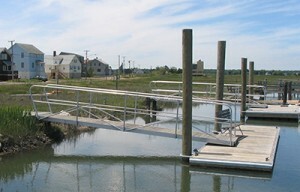 By using a combination of structures such as a pier, ramp and float, there is less impact on the environment. At Beebe Dock & Mooring Systems, we specialize in creating dock systems to get you from your door step to the water safely. Each dock project is unique; a combination of the client’s desires, in balance with consideration of the surrounding environment. The solution is a custom, one of a kind structure which is designed to compliment your property and the need to access the water. At Beebe Dock & Mooring Systems, we take pride in building a quality built dock system, designed to provide years of enjoyment at the water’s edge. Here is an example of a dock system designed to access deep water, while complimenting the exterior features of this CT shoreline estate. Presented with a failing wooden pier and support structure, we recommended a full replacement dock system. Beebe Dock & Mooring Systems aided in the design of the new pier, and after removing the old pier along with its crumbling cement bases, we used steel I beams to span the new quarry stone bases. The pier’s Ipe decking was recommended for low maintenance, and the painted wood hand railings provided a safe and secure walkway to the water. Stainless Steel wire was used below the hand rails to add additional safety and an elegant look to this pier. 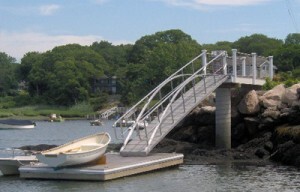 A custom arched aluminum ramp joins the pier to the dock, and adjusts to the tides rise and fall. Due to the rocky coastline, pilings could not be used, so stiff arms were used to hold the floating dock in position. Click here to see additional pictures and the stages of construction. The simplicity in this dock system is its single connection to a cement platform, off an elevated rocky shore. From here a long arched aluminum ramp reaches out to the wooden float, which is held in position with a mooring system and attachments to shore. For reason of aesthetics, clients frequently prefer this type of system over pilings. This dock system provides deep water access from a rocky shoreline, while adjusting to a substantial tidal range. 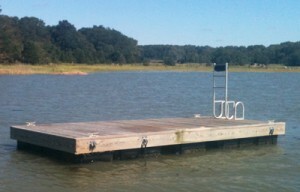 The design brief called for an attractive low maintenance, easy access dock system. In an effort to compliment the surrounding shoreline, a natural Ipe decked pier was secured to a single cement support column. 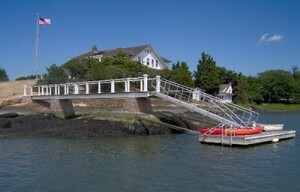 This arrangement provided minimal environmental impact, and an attachment point for the arched aluminum ramp to access the floating dock below. The floating dock rises and falls with the tide, and was secured in place with moorings and attachment points on land. Once again access to the water was the need here, but with little or no impact to the marshy shoreline. 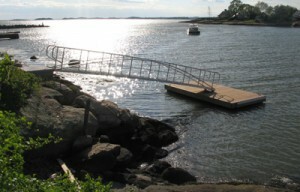 A hinged aluminum ramp, secured to a raised platform, reaches out over the water and rests on the wooden float. The float is then held in place by 2 pilings, driven into the river bottom. This floating dock is constructed using quality pressure treated lumber and galvanized hardware on high density plastic floatation. Swim floats are popular in lakes and protected harbor settings. They are stable low profile wood or plastic structures, designed for family fun. They are easy to climb aboard, and provide a place to rest while enjoying the sun and water. As added safety, we install sturdy aluminum ladders which are easy to climb, and swing out of the water to prevent barnacle growth. To hold the float in place we recommend an underwater mooring system, which Beebe Dock & Mooring Systems can provide and install. Why a modular floating dock is right for you? Connect-A-Dock floating dock systems are versatile — the modules can be configured end to end or side to side, as long and wide as you wish and for many different applications or configurations on water or land. polyethylene construction ensures many years of dependable service.